The following is a guest post from my sister, Erin Bilyeu. Erin is currently in Bellingham, Washington but she has family in Wisconsin and did her graduate work in Milwaukee. She was watching the recall election closely. 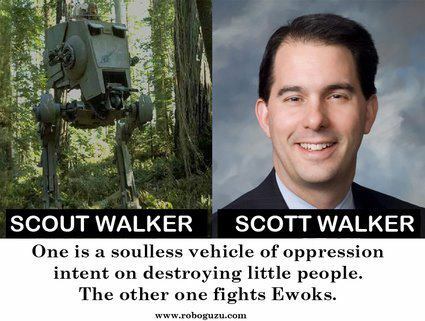 When Walker survived the vote she was…not pleased. My very first introduction to the wiles of Scott Walker was as a graduate student at the University of Wisconsin – Milwaukee. ScottyDubs, as I like to call him, was then the County Executive for Milwaukee County and a staunch advocate of privatizing public assets (see the Milwaukee airport) and severely limiting public services (see the Milwaukee County Parks System, and County Transit System). Although it has been five years since I left Milwaukee to pursue a career in the public sector, I have followed his bizarre rise to national fame as one of the most brazen anti-worker governors in the country. I wanted to write something eloquent and witty about the results of June 5 recall but like Leslie Knope, I find myself angry. (I tried to find the season finale debate from Parks and Recreation but couldn’t find a clip).